When we first bought our house, we obviously didn't think the renovation would be quite this intense. We knew it would far beyond what any normal people would attempt, but we didn't quite envision we'd still be elbows-deep in sawdust and headaches five years later. Part of the problem? Water damage. When we opened the plaster wall in our dining room during demolition, exposing the long-hidden logs, we saw that a couple of the bottom logs were so thoroughly rotten that they completely crumbled onto the floor. Oh crud, we realized. That means there's not much of anything supporting that wall all the way to the roof. We had to find and fix whatever leak we had ASAP, lest the house come crumbling down. So we went upstairs and started knocking down walls. We'd been planning to gut the whole place anyway, but we were not prepared for what we found when the drywall came down: a rolled up towel, shoved into a crack in the roof and drywalled in. As it turned out, when the previous owner built the addition (which houses our living room and guest bedrooms) on the back of the house in 2000, the roof never quite matched up so it leaked. Instead of fixing it properly, this previous owner thoughtfully placed a towel in the crack to absorb the leak before closing up the wall. The towel actually did soak up the water, which then slowly dripped and drained down the logs for the next 10 years. Shockingly, we didn't find any major mold issues when we opened the walls. But the rot was more than enough to throw our plans into a tailspin. Once we assessed the damage and regrouped, we realized we had to remove all the logs on the dining room wall and replace them with regular old framing lumber to ensure proper structural support. (This was, of course, in addition to removing the towel, fixing the roof and properly sealing the house to prevent future water damage.) That's why the large wall in the dining room has wood planking instead of exposed log. The good news about all this was that, by removing the log wall and replacing it with regular 2x4 framing, it freed us up to modify the floor plan and change up the doorways a bit. Silver linings, I suppose. 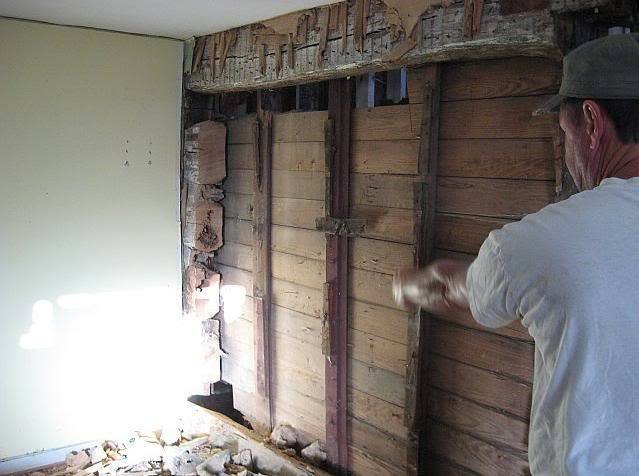 The left-hand plank wall is the one that had to be completely replaced due to water damage and rot. You could say I'm a bit wary of leaks now. Water left to its own devices is not your friend. Another thing that I find terrifying now? TERMITES. When you live in an all-wood structure (and most of us have quite a bit of wood in our homes), the prospect of having it eaten right out from underneath you is a little unsettling. And where there are water leaks, termites can come sailing right in. Water = bad. Water + termites = worse. We’ve never seen evidence of termite damage, knock on wood (badump-ching), and after all we’ve been through, I’m hoping we never do. It's just a mud wasp's nest, which is not very comforting (call me crazy, but I don't enjoy bee stings), but my initial fear was that it was a termite tunnel. I mean, it is a pencil-sized insect tunnel making its way under our wood siding. For all I knew at that moment, all that was left of my lovely new board and batten siding was just the outer layer with its fresh coat of Crabby Apple. Everything underneath could be mush! Though he knew that particular tunnel was from a wasp, Ez agreed it was a good idea to call for a termite inspection just to be sure there weren’t tiny homewreckers lurking somewhere else. After all the hard work and investment we put into this place, couldn’t we afford a FREE termite inspection? (Yes, some are free, but take care to read any fine print before agreeing to and signing anything.) Why yes, I think we can swing that. And so should you, every couple years, if you care about your home and your money. This is a sponsored post. The opinions expressed above, however, are 100% my own. Thanks for being a real person! And for commenting. :) It's always nice to hear from new people. Good luck on your anti-leak brigade... Fingers crossed for no mold or major damage! while I love having rain to keep my yard nice......I despise rain because that means over time our wood door jams ROT! UGH now we have to hire someone or DIY the repairs as soon as the HOT summer Kansas weather finally breaks. We have had so many 100 degree plus days this summer that I lost count. Being a homeowner is great until something goes rot. Yes, ... leaks. I believe you've done the right things here. One day during rain, I stepped on wet carpet by the (Previous house) back door. WATER! I searched the attic for leaks, couldn't find one. I opened the wall about 4 foot up and found nothing. Open it at floor level and found water, but not from the rain. I had installed a dish washer a year earlier and it was leaking behind the cabinets, along the wall and into the stepped down family room. It took me 3 seconds to tighten the tubing leak and 2 days to patch and paint the wall. Yes,.... leaks. My in-laws had just finished a beautiful renovation of their master bedroom literally a week before Hurricane Sandy hit last year. During the storm, the wind blew a shingle off the roof and sent water streaming down their freshly mudded and painted bedroom wall. Water was literally coming out of the outlet. Talk about danger and mess and destruction! The past two nights, Ez and our carpenter John have been working together to get all the final, last-minute issues taken care of for drywall (ie making sure all the studs and joists are level, making sure all the corners have something to screw into, etc.) We also had our little drywall hauling party last night, so that all 75 sheets are now upstairs. We're almost ready! Heavy!....and they look like 10 footers too! termites are the worst thing for your house, Even worse then water. Water damage needs to be taken off and new wood replaced, and problem solved. Just make sure no water is leaking and your fine. Termites keep coming back. Good luck.